UK, 1979, 98 minutes, Colour. Christopher Lee, Milo O' Shea, Oliver Tobias, Mickey Rooney, Peter Cushing, Puneet Sira. 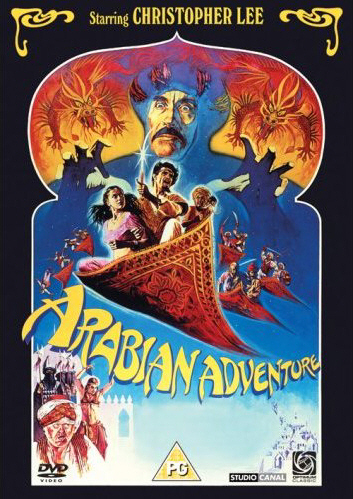 Arabian Adventure is very enjoyable matinee material - filmed in Spain by the British team of John Dark and Kevin Connor who made the adventures. The Land That Time Forgot, War Lord Of Atlantis, At The Earth's Core. The film has a very good villain in the form of Christopher Lee. Oliver Tobias emulates Errol Flynn heroics. There is very broad comedy from Mickey Rooney and sly comedy from Milo O' Shea. The focus of the film is on an engaging little boy played by Puneet Sira, who steals the film. There are all kinds of special effects culminating in a flying carpet battle. 1. The appeal of the Arabian Nights, Arabian adventures? The popular stories, exotic settings, action? Magic? 2. A British production, technical and special effects, decor sets and costumes, colour photography, the special effects especially the magical tricks, Alquazar's mirror, the flying carpets? 3. The contribution of the stars, especially Christopher Lee and his sinister presence, the presence of Peter Cushing? 4. The focus on Majeed? His introduction to the city, his innocence and observance of the city, surviving the difficulties, hunger, being humiliated? His monkey? Being pursued, surviving, saved by Hassan? The sapphire and the genie, his being saved three times? The flight on the flying carpet, getting the rose, his participating in the adventures? The happy ending? Audience identification with him as hero? 5. Alquazar as villain - as personified by Christopher Lee? Evil, power, consulting the mirror? The atmosphere of magic? His daughter and his forbidding her to consult the mirror? His control of the city, his troops and their attack? His paying Khasim? Tyrant, the commissioning of Hassan to get the rose? The return of Hassan, the fight, the gaining of the rose and his being imprisoned in the mirror? The irony of his better self already imprisoned in the mirror ? 6. Hassan and Zuleira - hero and heroine? Young, attractive, destined for marriage? Prince and Princess? Hassan and his arrival in the city, being victimised, seen by Alquazar, the imprisonment, the sword-fighting to the throne room? Rescuing people? The mission for regaining the rose? The carpet flight, the encounter with the fire-breathing engines? The difficulties in gaining the rose? His return, the battle of the flying carpets? The happy ending? 7. Khasim as humiliating Majeed, tyrant, betraying people, going on the carpet, trying to get the rose, his failed mission, being turned into a toad? 8. The good people of the city, the imprisoned wazir and his being reinstated at the end, the oppressed people and their rising against Alquazar? 9. The genie and the sapphire, her protection of Majeed, saving his life three times? 10. The flying carpets and the journey, the trick photography, the island? The engines and their being stoked by the guardian of the rose - broad comedy? The dangers of the pond and the monsters? 11. The gaining of the rose, the flight home, the monkey and the rose? 12. The culmination in the flying carpet battle - the effect of the carpets and the war, the special effects? 13. Basic matinee ingredients and their perennial popularity - heroes and heroism, villains, princesses to be rescued, feats and survival, courage and endurance, right and wrong?